Camp the hassle free way at this great festival set in the beautiful hinterland Sunshine Coast village of Kenilworth. This will be the Sixth. Sunshine Coast Ukulele Festival. Patrons must purchase a camp site through the event before purchasing Tent City!!! Tent City Hire will set up on the oval, a short walk to facilities, the main concert marquee and the festival village. There is so much to do and see in this beautiful part of the Mary Valley – if you have time after you check out the great Festival program on www.sunshinecoastukelefest.com There are artists coming from both the USA and the UK to entertain and teach workshops. So if you want to be entertained or taught this great instrument – be there. Accommodation packages are available as single or twin/triple share. Minimum stay is two nights. Remember all patrons staying on site have to pay site fees separately when booking your festival ticket through the festival website. Twin share is ideal, allowing plenty of room for beds, luggage and easy movement within the tent. Families and groups can be allocated tents together, but it is necessary to mention this when booking. For families with small children a number of tents are erected with the awnings joined. This allows up to six people to be accommodated together in two rooms under the cover of one roof. Again ask for this when ordering. 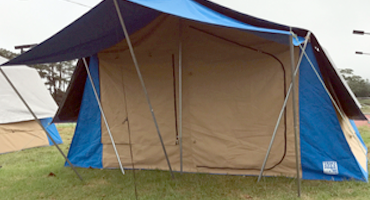 The tents are carpeted, screened and fitted with a 12-volt light. All Tent City accommodation includes fold-up bed/s and mattress; you will need to bring your own bedding (sleeping bag or sheets, blankets & pillows etc.) if linen packs are not ordered. Alternatively a limited number of linen packs are available for hire.Linen packs are available for hire. They consist of 2 sheets, pillow case, pillow, blanket, doona and doona cover (towels and toiletries are not included). Cost is $60 for a single bed and $80 for a double bed. Linen packs must be pre ordered. Regular patrons will attest to the convenience, warm, friendly atmosphere and cooperative staff that makes this facility a popular alternative – these patrons have become friends over the years, and we look forward to catching up with familiar faces and adding new ones to our ever-growing Tent City “family”. See you there!